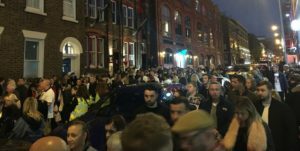 Hundreds of people marched through the city on Saturday night to highlight the victims of knife crime and to protest against those who carry weapons. The memorial walk was organised by #NoMoreKnives – a campaign that is working towards putting a stop to their use in Liverpool. The march began at 6pm in Williamson Square with the memorial date marking the one-year anniversary of Sam Cook’s heart-breaking death after being stabbed. Mr Cook, an electrician from Crosby was celebrating his 21st birthday in Liverpool city centre when he was killed in October last year. The walk finished on Seel Street, outside Empire Bar where the 21-year-old tragically lost his life. Family and friends paid their respects by laying flowers and lighting candles on the steps of the club to honour Sam. Sam’s dad, Alan Cook, spoke to the crowds gathering before the march began and said: “The police, the government, the councillors and the community all need to get together because I do not want anyone to go through what we have been through in the last 12 months. John Hughes, a partner in the No More Knives campaign spoke to the crowd outside Empire, and said: “We are the 99% of people, we are the good people in this city. Mr Bentley, the founder of No More Knives, explained that Saturday night’s memorial march was a reflection of positivity to show Sam’s family that the city is supporting them.